More One Song Onlys next time, I hope. But now, Joni. Again. I wrote once about the pleasures to be found in going deep into a major artist’s back catalogue and spending time with the minor records: the fiascos, semi-failures, secret successes, curate’s eggs and baffling left turns. Joni Mitchell’s body of work – large but not vast, varied but always idiosyncratically reflective of its creator’s self – really rewards this kind of listening. To that end, I’ve been revisiting Don Juan’s Reckless Daughter, Mitchell’s 1977 double album, trying to decide what I make of it these days. Don Juan’s Reckless Daughter was not kindly received by critics or the public on its release*. While it sold enough to go gold, it was the last Joni album that did reach that benchmark, and record-store lore has it that it’s the most returned album ever, or at least one of them. Small wonder – this is a double album by Joni in her “jazz” phase. Its four sides are heavy on Jaco Pastorius’s hyper-kinetic fretless bass and feature a 16-minute piano-and-orchestra song, Paprika Plains, that takes up the whole of side two. Its 59 minutes contain scarcely a snippet of melody that will stick with you after one listen. There are, however, slowly uncoiling verse melodies that will work their way in if you listen to the record 10 or so times, if you have the patience. At 21 or 22, my devotion to Joni Mitchell was such that I did have the patience. I put in the time, and am on the whole a defender of the album, in all its bewildering excess. More recently, though, I’ve hardly listened to it. There are Joni records that offer more immediate pleasures, and not listening to her music as much as I did in my early twenties, when I do, I want to hear my favourite stuff. 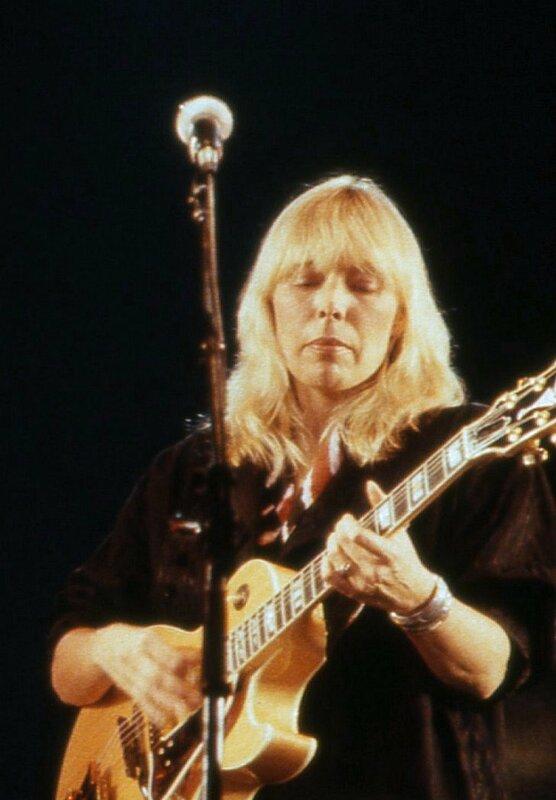 After The Hissing of Summer Lawns, Mitchell stripped back the electric jazz sound she and the LA Express had constructed over the past two records (and taken on the road – check out Miles of Aisles for a very decent document of Joni live in 1974) and rebuilt it around her acoustic guitar and new recruit Jaco Pastorius’s fretless bass guitar. This updated formula worked to stunning effect on Hejira‘s first side. DJRD is hit and miss in comparison, but even after spending time with it this week, I find it hard to put a finger on quite why. Partly, I think, it’s that the extended melodies of Hejira and Summer Lawns had little phrases that lingered in the memory and allowed you to hang on to the verse as a whole, a quality not always apparent on DJRD. Partly it’s that a lot of the chord sequences and strummy rhythms are samey – compare Cotton Avenue, Talk to Me, the title track and Off Night Backstreet. And partly (and I say this while acknowledging that Mitchell works at a level only a couple of other pop songwriters have ever attained), her lyrics on DJRD just aren’t quite at the level of the albums preceding it. There’s nothing here as arresting or moving as Amelia, Harry’s House, Edith and the Kingpin or Woman of Heart and Mind, let alone the more concise, melody-anchored songs of her early career, the Circle Games, Chelsea Mornings, Rivers, Both Sides Nows and Little Greens that any songwriter in any genre would give their right arm to be able to write. When Don Juan’s Reckless Daughter came out, Mitchell had released five more or less brilliant albums in a row, plus a couple more very good ones before that. She had to strike out sometime. And this minor, flawed work is fascinating because it’s so close in form and style to Hejira, which in any fair appraisal of Mitchell’s oeuvre has to be counted as a major work, even if you’re not fond of Pastorius’s bass playing. Every great Joni record represented both a stunning collection of songs and a stylistic development from her previous work. DJRD is Hejira part 2, even with The Tenth World and Paprika Plains on it. It was the first time she failed to make a musical advance on her previous work. I’d recommend Hejira to anyone. It’s not my favourite Joni record – over the full album length, I find the Joni-and-Jaco arrangements wearying – but the first three songs are heart-stoppingly good, and it demonstrates that the forms and structures she was working with in the mid- to late-1970s were not themselves holding her back. Don Juan’s Reckless Daughter, though, is one to save for when you’ve heard everything Mitchell did between 1970-1976 and wonder what it would sound like to hear a great artist losing contact with their greatness. That might sound odd, but trust me, it’s worth doing: it makes you appreciate that greatness all the more. *The cover of DJRD largely escaped critical censure at the time. Featuring as it does Mitchell in blackface and, on the inner sleeve, dressed as a Native American, that seems scarcely credible. Forty years on, the best we can say for it is its creator seems to have remained unaware of how crass it is in concept and how offensive it is in execution. This entry was posted in Music and tagged Blue, Cotton Avenue, Don Juan's Reckless Daughter, fretless bass, Hejira, Jaco Pastorius, Joni Mitchell, LA Express, Miles of Aisles, Off Night Backstreet, Paprika Plains, Talk to Me, The Hissing of Summer Lawns on July 20, 2017 by rossjpalmer.